Researchers at Rice University managed to prove it possible to determine the edge properties of graphene nanoribbons by controlling the conditions under which the GNRs are pulled apart. The line-up of atoms along the edges of GNRs determines its properties - metallic or semi-conducting. These properties bear great importance for various applications, electronics being among the leading ones. 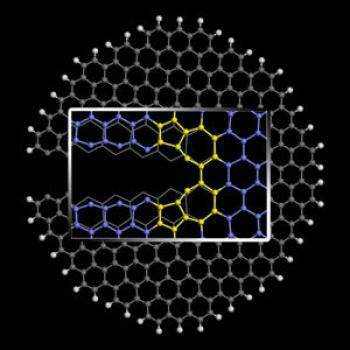 The Rice scientists used computer modeling to demonstrate that it is possible to pull apart nanoribbons and get graphene with either pristine zigzag edges or "reconstructed zigzags" (referring to the process by which graphene atoms are shifted around to form connected rings of five and seven atoms). The scientists used density functional theory (a computational method to analyze the energetic input of every atom in a model system) to learn how thermodynamic and mechanical forces would accomplish the goal. Their study revealed that heating graphene to 1,000 kelvins and applying a low but steady force along one axis will crack it in such a way that fully reconstructed 5-7 rings will form and define the new edges. Fracturing graphene with low heat and high force, on ther other hand, is likely to lead to pristine zigzags. This ability is meant to assist in making graphene with the right type of edge to match the required properties for an application, and could be very helpful in making graphene-based nano devices by way of mechanical fracture.